If you keep heading southeast in to Trat province along the gulf of Thailand, the country grows thinner and thinner until you reach the narrowest point. Theres a couple of signs pointing to an area, but it’s just an ugly work site. They should at least put some random statue there, like a tiger, zombie, or giant gorilla. Less that ten km’s is left of Thailand at this point. The road becomes a lot of fun, twisting and turning through the lush vegetation, rising and falling over small hills, and then you are at the tiny border crossing. The name is Hat Lek on the Thai side and Koh Kong on the Cambodian side. I went through in the middle of the day and it was fairly empty. Just a tourist bus coming across, a handful of vehicles, and all the usual border touts looking to scam some money off of you. It’s definitely a bit more corrupt than most borders in SE Asia. At most, if you call them out on the scam and refuse to pay, they will drop it and move on. 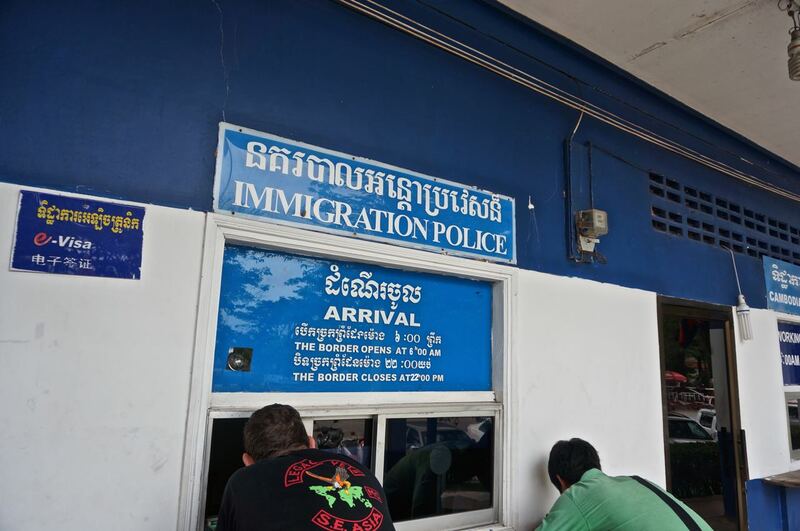 At the Hat Lek border everyone on the Cambodian side is corrupt. Officially all that you need to pay for is a visa, which costs $30. If you’re able to get across only thirty dollars poorer then you did a good job. They have the usual table of guys by the official window who are asking for your passport. If you give it to them they will fill out your visa form for you and then demand at least five dollars to get your documents back. Also, they will try charging you for the form, which is free. They wear an outfit with a badge that almost looks official, but don’t be fooled, they’re scammers. The next group of fellas looking for some money is the health check. They direct you to the table, point a “thermometer gun” at you to check your temperature, then charge twenty baht and give you a useless form. I picked up the gun and it looked like a cheap Chinese toy, and definitely didn’t work. At sixty cents I wasn’t too worried about it. The immigration officials are the ones that really get you. Instead of the $30 for a visa, they tell you it’s 1500 baht, which is about $45. They will only accept Thai baht, which makes no sense being in Cambodia, and if you don’t have any you’re forced to exchange some dollars on the street at a terrible rate. I tried arguing with them, but they had all the power and held the visas, and was forced to pay. It ended up being almost $50 ($15 for his pocket). It’s wild to me that these borders can still be so blatantly corrupt and these guys can get away with it. After getting my visa they directed me over to a small shack on the other side of the road that had a sign for customs. This is where I should have done some paperwork to be able to take my motorcycle into Cambodia, which I would show when I depart. I’m pretty sure the officer was drunk and he wasn’t making sense. After pestering him he asked for my route. I told him that I was making my way through and up to Lao, and to this he responded, “I cannot give you form”. I asked him a few more times, and he kept half ignoring me and half grunting nonsense. Finally he looked at me with a serious face and and waved his arms as if to say “just pass”. I was sick of the border at this point and didn’t trust him filling out my carnet so I decided screw it, and if he’s just telling me to go through then here we go. I’m hoping it’s not going to lead to problems on the Laos border, and I’m not going to worry about it until the day comes. Crossing borders is always an adventure. The biggest change going into Cambodia is the roads. Thailand has really nice roads all over the country, but Cambodia’s roads are in another world. 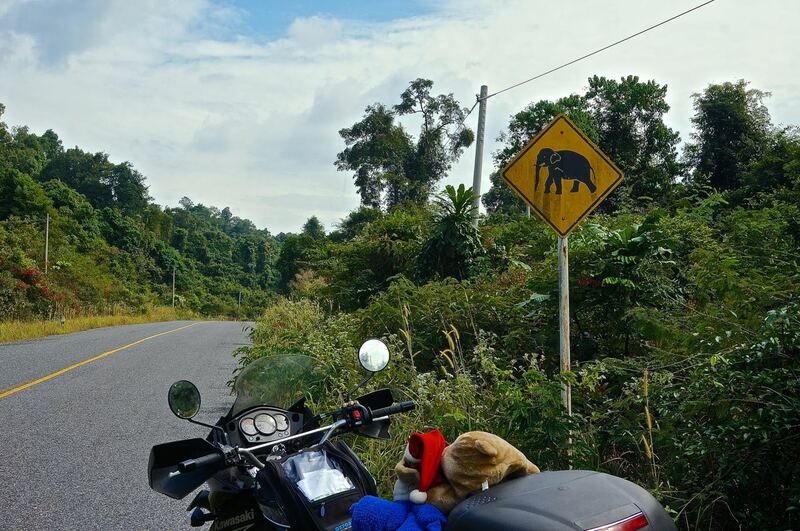 The first section is the quality of one of the small concrete roads along a Thai beach in the middle of nowhere, but at least you get to watch out for elephants. Then the rest of the way to Sihanoukville is a dusty chopped up mess. It looks like they’re doing a lot of work and someday might have a good road, but for now it’s not at all. Shortly after arriving to Cambodia, I caught a glimpse of what the drivers are like. A military truck came flying way too fast around a corner and flipped. The cab was completely smashed and there’s no way the driver could have survived. Size definitely matters on the roads here. If you’re a motorcycle then watch out. Trucks, buses, vans, and cars all drive as if you’re invisible. It happens over and over getting forced off the road onto the shoulder by someone passing another vehicle. They pretty much take over your lane like its theirs, and if you don’t like it then they will run you over. Your guard has to constantly be up. While checking out the wreck I met a Russian guy on his 1200 Kawasaki and we rode most of the way to Sihanoukville together. It’s nice having someone else to share terrible roads with, but I like to stop at a lot of random places and anything that catches my eye. My attention span is pretty short and I get led off track easily, which makes it hard to ride too much with others. In Sihanoukville there are a few different beach areas. Around the city center the closest are Liberty, Independence, and Sokha beaches. Farther east along the coast are Serendipity, Ochheuteal, and Otres beaches. I headed to Otres because it was a nice chill spot the last time I was in Cambodia, and could get a bungalow close to the water for about six bucks. All that has changed. The road is still a rutted out sloppy sandy muddy mess, but they have started building small resorts and much more is in the works. Now for a crummy little bungalow they were asking twenty dollars and up. I’d rather camp on the beach anyways, so I went on a little search and found the perfect spot. A nice flat spot on the firm sand up from the tide. It was in front of a vacant lot and surrounded by hotels down each side. I wasn’t too worried about it. If they made me move they made me move. A big goofy older guy, who turned out to be South African, had a spot he was pretty much living. The tourist police had put him there, and he had a couple lounge chairs, a barbecue pit, and a lot of random junk. He assured me it was no problem and it was a free beach to anyone. He was strange as hell, but I decided I could deal with him for the spot. It was another gorgeous sunset in SE Asia. He turned out to be harmless, but annoying beyond belief. I was still a bit sick and feeling really crummy so I headed to bed at about nine thinking I could get a good long rest. Camping next to Mr. “I’ve been a doctor for 37 years” was not going to allow for it though. No matter how many times I told him to leave me alone and that I was fine, he insisted on waking me up about every half hour the entire night. He brought me lots of random pills, smelly tea, dirty rice, wanted to feel my head for temperature and feel my pulse, told me I needed to go buy condensed milk, said that more sleep was no good for me and I needed to get up, and a bunch of weird things like not to trust the sand. By four in the morning I was pretty pissed. Usually sleeping next to the ocean is the best, but it wasn’t the best night. Oh well, you gotta have some bad ones to appreciate the good ones. I got going at sunrise and packed up. It’s kind of sad whats becoming of the area. Unfortunately, the big vacant lots are destined to be casino resorts. The whole area is changing rapidly, and for the worse. The environment and land management is the last priority for the Cambodian government and it seems like a lot of the people could care less, or have just given up against the government and big business. The Journey continues into Cambodia. This entry was posted in border crossing, Cambodia travel, camping, Kawasaki KLR650, Motorcycle world travel and tagged bad roads, border crossing, cambodia, corrupt, immigration, klr 650, koh kong, motorcycle, ride, se asia, Sihanoukville, sunsets, travel. Bookmark the permalink. Neat you are traveling in these areas now before they change so drastically!